You will shop on the BYO Recreation site to assemble an order, but you will not place your order with them. Rather, you will assemble the order and then email it to ClassWish for us to place. Please follow these easy directions. When you have donation funds to use (or are about to add your own funds), go to http://www.byoplayground.com/ (To see other vendors for other categories, please go to the home page of this ClassWish vendors site). 3. Follow the Process Below. Shipping Address: You must provide the school address. We cannot ship to your home. 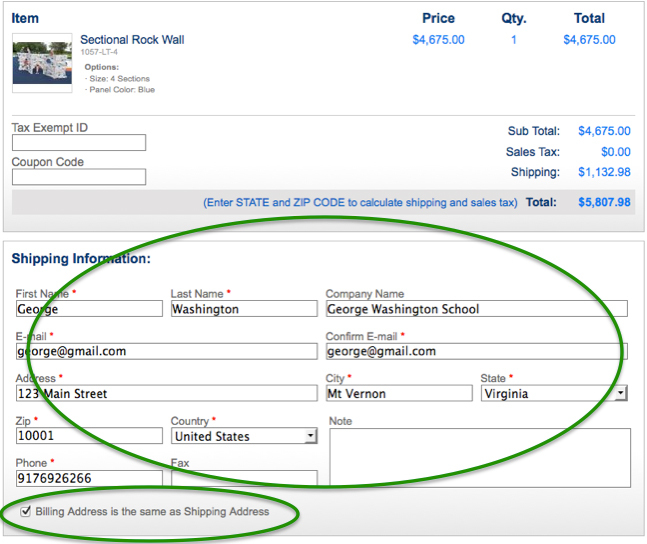 Leave "Billing Address is the same as Shipping Address" for simplicity, you will not be actually purchasing the order. Phone: Provide the school phone # in case of delivery problems. Copy and Paste the entire Shopping Cart (circled in green in the illustration to the right) into that email. Be sure it includes all the items, the freight, tax and total. Your school's shipping address (circled in green in the illustration to the right). Do NOT provide your credit card info. You are only using the BYO Recreation site to assemble the order, not to place it. “I hereby request these materials from ClassWish. I confirm that they are for educational use in my classroom or school, and not for personal use. I will abide by the ClassWish.org User Agreement, which appears at http://classwish.org/classwish/user_agreement. I understand that ClassWish will purchase these materials and will deduct from my ClassWish Wish List account the amount that appears on the shopping cart summary, including shipping and tax, if any. I further understand that ClassWish is donating these materials to my school for my use in my classroom. We will submit the order to BYO Recreation (or another supplier) and pay for it. BYO Recreation (or another supplier) will ship the materials to you at your school.